This photo was taken in London before she was sent to Longhope in 1874. The forth launch was to assist SS Ben Avon, this involved returning to shore to send a telegram to Thurso requesting a steamer to tow ship to safety. After the fifth launch in 1891 a Silver medal was awarded to Coxswain Benjamin Stout in recognition of his gallantry on 30 March in connection with the s.s. 'Victoria' of Sunderland. Eleven of the rescued crew of 22 were Germans and the Emperor of Germany presented a gold watch to the Coxswain and £24 to the crew of the lifeboat. This was the first boat to serve at Longhope, she was housed in the old boat shed at the Brims / Longhope junction. The Dickinson Edleston was a wooden, clinker-built boat constructed by a London company Woolfe & son. 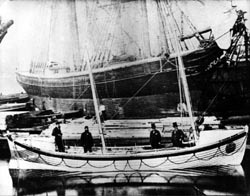 The boat measured 37 feet by 9 feet 2inches and was a 12 oared, self-righting lifeboat which in 1897 cost £475-5-6d to build. She was transported up to Thurso by train where she was launched to be towed to Stromness in order to be sailed back down to Longhope round about the 23rd of September 1874. She was later condemned when rot was found to have set in and on capsize trials she did not right herself fast enough.